Customer Support is the backbone of every business right at the moment customers are aware of their rights hence multi-channel support is required to manage all at one place thus helpdesk solutions are in trend. Offering multi-channel customer support requires a secured, scalable, extendable, and modular helpdesk software. Every trade entire the world intended to earn and expand with the large customer base that is possible only through quality delivery of the purpose your business is built for with the better customer support experience. Scalability is highly important to rely upon any helpdesk system. However bad coded or bloated systems are also capable to deal with 10–20 request at the same time. As a business grows it increases customer base as well, if there is a good customer base for sure there will be the inquiry, complaint, return and refund queries all will rise day by day. Enabling customer to connect through multi-channel for raising their concern to get instant and right solution from the support assistants, multiple requests at the same time may down your helpdesk. Load scalability, functional scalability, speed, and performance capacity, and how good helpdesk is in executing the third-party caching tool? is needed to handle the entire process using scalable helpdesk software. If you want to implement Redis is a massive task in OSTicket but in UVdesk it can be easily implemented as it is built on the top of Symfony PHP Framework that supports all kind of caching tools and utility. Tools and utilities supported by UVdesk are Varnish Support, Varnish Reverse Proxy, Memcached support, Redis Support, PHP 7 Support, Message Queue Support, GraphQL Support and many more. Helpdesk means support software and it deals with customers so the data stored or dealt by helpdesk belongs to the customer. Client data may include personal data, card details, server information, financial details, and many others. Security must be the core of the customer support application thus the UVdesk is built on the standard of OWASP (Open Web Application Security Project). Multiple security vulnerabilities are found in OSTicket System. There must be a right protection system for security threats like SQL Injection, XSS, CSRF, Client and Server Site Validation, and many more. Thus UVdesk Team has taken this very seriously as we the Webkul are also using UVdesk Helpdesk System to deliver secure, reliable and flawless support all our 80k plus customers. Furthermore, we’re constantly updating the UVdesk helpdesk system built on Symfony which is already secured. As we’ve rich experience in the e-commerce industry we’re dealing with and every day we receive the number of customizations hence we truly believe every business is unique so one solution for all may not work. That’s why we’ve built UVdesk and it is available as a SaaS-Based Helpdesk Solution and Free Open Source Helpdesk Software. 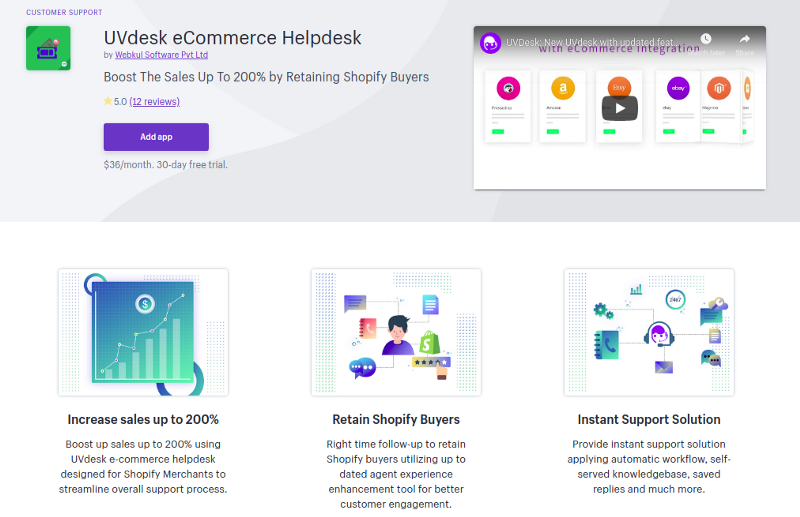 UVdesk offers Multiple CMS Extensions and Dedicated Shopify Helpdesk and BigCommerce Helpdesk to reduce the merchant’s workload. 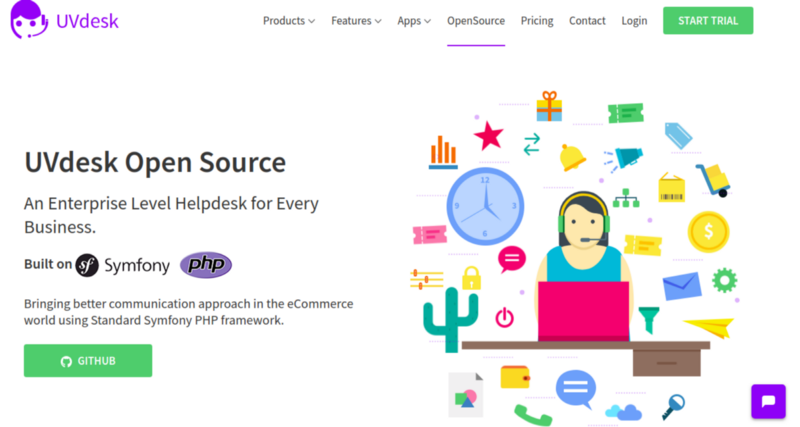 UVdesk offers full-fledged third-party module support so any developer can build module utilizing the source code of enterprise level open source helpdesk. UVdesk is based on Symfony so it is component based so the modification or building modules easy on it but tough to build the module on osTicket. UVdesk Open Source Helpdesk Ticket System provides full-fledge liberty to customize as per business requirement. OSTicket does not follow a standard framework even the basic features are missing there, right at the moment not having composer driven system is a major drawback. Composer Driven System is the basics which are followed by almost every existing software like Magento, Symfony, Laravel all are on the composer. Symfony itself has introduced the composer 6 years back. Model View Controller: Composer based MVC architecture includes the component that provides Agile Development Support. Let’s take an example: based on business necessity UVdesk Helpdesk user requires to include libraries that do not exist in UVdesk still, you can easily include that because it is constructed using Composer Based MVC Framework. Not possible to include needed libraries in OsTicket you may include that but for sure it is going to be a bulky and massive task. UVdesk is based on different pagination system so it is easy to code. 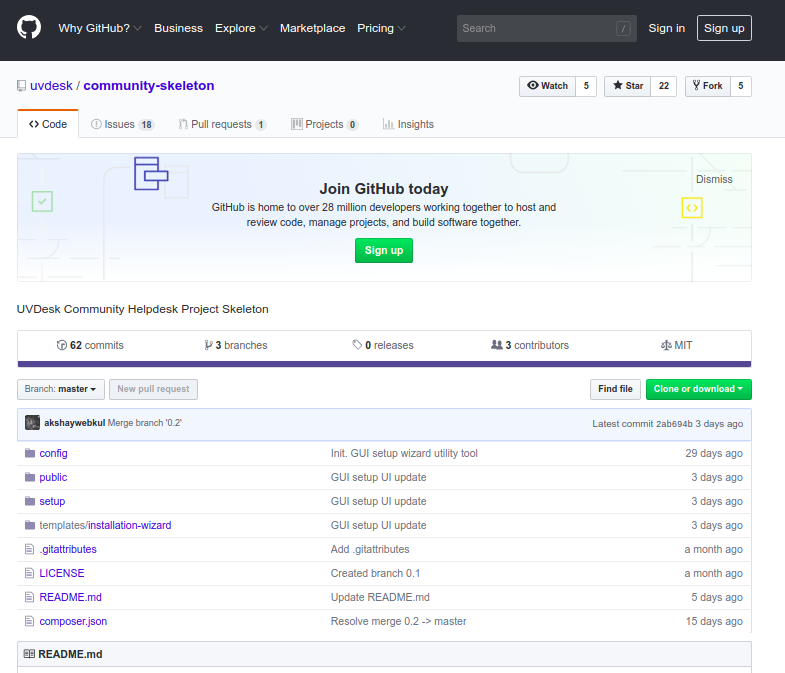 It is Free Open Source PHP and Symfony based helpdesk. Symfony and PHP both are on the top, right at the moment all across the globe for developing web apps. PHP & Symfony both are remarkable plus famous among all the developers. So it is way easy to find the developer to customize the UVdesk Open Source Helpdesk to make it fir for the business purpose to deliver excellent support. Flexible to be customized for complex and high-grade support requirement of any trade can be easily done with the very economical charges by hiring a developer. Because of high community support, popularity, and constant updates, a huge developer base is also available to do any customization. OSTicket is not following the Global Development Architecture even not following TDD (Test-Driven Development). UVdesk is built on Symfony Based Arcticuture plus we’ve applied LAMP/LEMP stacks to make the UVdesk Open Source fit for any environment for the easy setup and host on any hosting supports LAMP/LEMP. We used all together to make UVdesk Open Source easy to set up and host on any hosting which supports LAMP/LEMP. 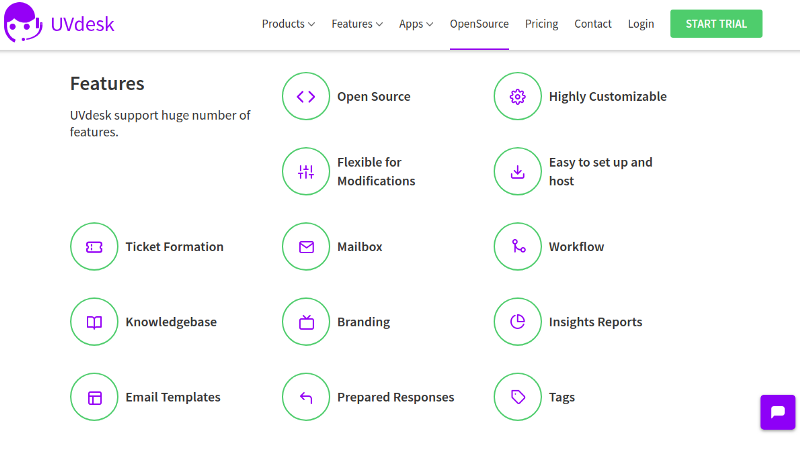 Open Source Enterprise Helpdesk UVdesk supports Email Piping, Mailbox, Automated-Workflow, Knowledgebase, Productivity Tools, Ticket Management Tools, Saved-Replies, Prepared Responses, Branding Management, and every other standard feature. Utilizing Free Open Source Helpdesk any individual can create multiple support agent, group or team to deliver fast and efficient support. 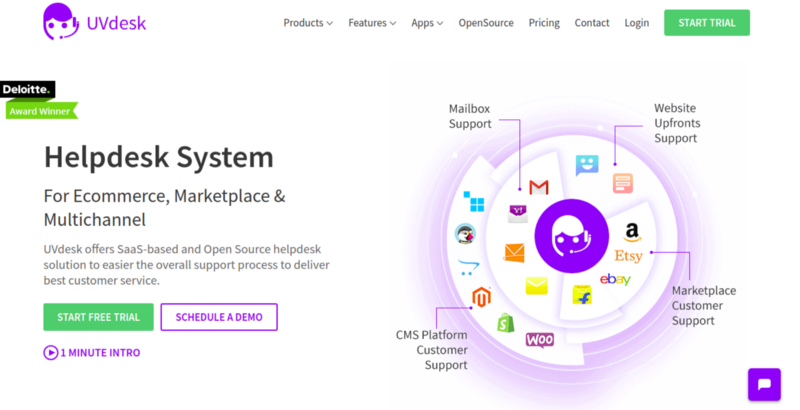 Hurry up to Install – Open Source Helpdesk and IMAP/SMTP Setup to configure support mailbox. Enjoy the versatility and extensibility of PHP-based Helpdesk System to be fit for any trade to for delivering better customer experience.